There wasn't much difference between 10 and 14 weeks, but you can definitely see a change here! We'll see how the waistline progresses over the next couple of weeks - I think it may be time to move to belly updates every two weeks instead of four. 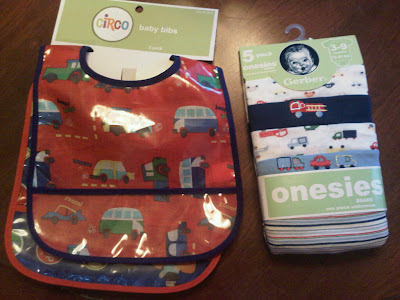 So in other fun news, look what a sweet surprise Sam got in the mail yesterday from his Auntie Kathleen!!! 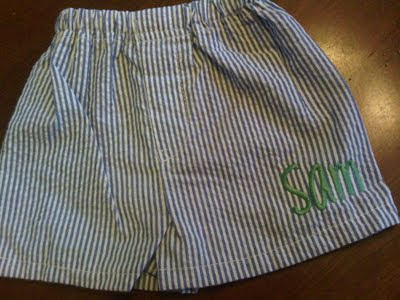 I was literally looking around on Monogram Chick's website this week and saw these shorts and thought, aw... how cute would those be for Sam?! Apparently my friends are mindreaders! 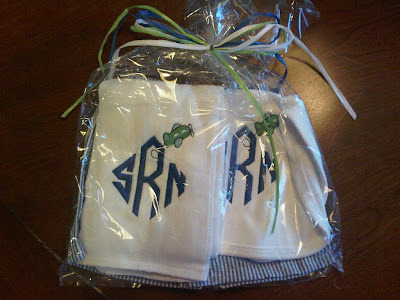 And look - it's Sam's very first monogrammed goodies!!! I laid all the swatches out for the hub last night and asked what he thought. He studied them for a half second and then pointed at the blue and white striped print. "That one." No, I mean ALL of them together, honey. "Oh, oh, yeah, OK." So you like them? "For what?" For the bedding. "Yeah, sure." Clearly he does not share my enthusiasm for these sweet fabrics, but he approves! Definitely starting to see a cute little bump!! Love those fabrics. Baby SNR is a lucky little boy already. Lookin good mama!! 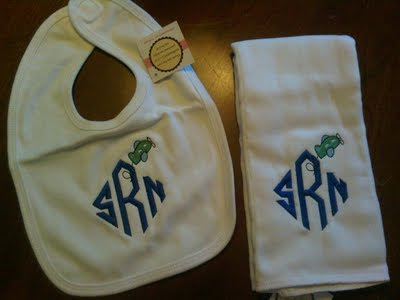 Sam's gonna be such a cutie :) And I love your fabric choices!! You look great! 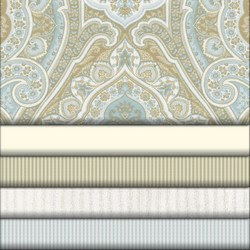 I love the bedding fabrics! Would you mind sharing where you found your fabric? I loved both the girl and boy choices! So adorable! Megan - click on the image and it should take you to www.babybedding.com. Under the "fabrics" tab, choose collections and you'll see a bunch! Very affordable for custom bedding - plus you can buy it by the piece (i.e. We're planning to just do a skirt and crib sheet and forego a bumper). Your preggy belly is so cute! I like the color choices for the nursery, very calming. :) I get so giddy for y'all every time I read your post. :o)!!! !